Dr. Chugay regaled me with a few stories over the phone the other day. There wasn’t any tone of superiority or intonation in his voice that belied arrogance. Just a friendly, personable man on the other end of the line. One who happens to be the best in the world in the specialty of body sculpting men. His pedigree and reputation is impeccable. And still he’s one of the friendliest Doctors I’ve had the chance to chat with. His earnest empathy while telling me about rectifying a botched implant surgery for a patient who had sought to save some money by having it done in India won me over. 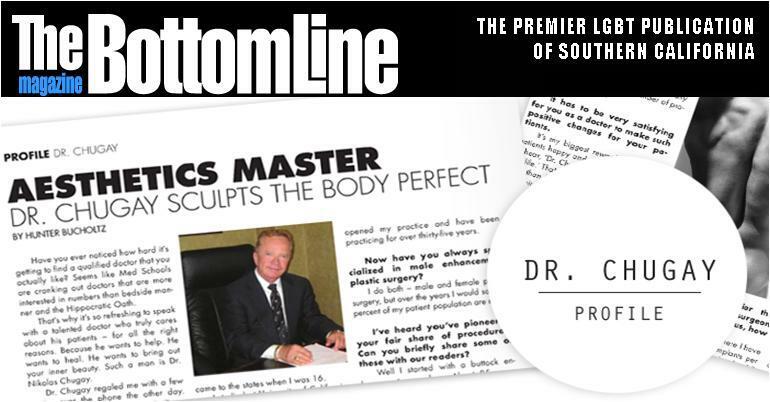 Here’s a doctor who cares about his patients, aesthetics to match the body type and the patient’s personal growth. If you’re considering any kind of aesthetic procedure, look no further than Dr. Nikolas Chugay – you will be in great hands. He now has a practice right here in Palm Springs, besides the one he has in Beverly Hills – splitting his time in between. Article replicated from the initial posting found at The BottomLine magazine. The BottomLine: Can you give readers a little background about yourself? Dr. Nikolas Chugay: Well I was born in the Orient, in China, of Russian heritage. I was raised in Brazil and then came to the states when I was 16. I studied at University of California, at Berkeley – got my undergraduate degree in comparative literature. So from a Bachelors degree in Literature, that’s a bit of a leap into medicine. What prompted you to become a Doctor? Well I also took pre-med. I took all my pre-med classes there. So from there I went to Medical College in Chicago. Did my internship in Miami – a rotating internship. Then I was drafted into the 101st Airborne Division for two years. I served as a Third Brigade Surgeon. Then when I finished that I went into residency for plastic surgery in Philadelphia. You have truly been all over the world! All over the place [laughs]. I started to actually practice in 1977. And then I went back for a fellowship in Rio De Janero in ’79 with a very famous Plastic Surgeon, Dr. Ivo Pitanguy – the top Plastic Surgeon, the most creative innovator, just a wonderful man. Then I came back to California and opened my practice and have been practicing for over thirty-five years. Now have you always specialized in male enhancement plastic surgery? I do both – male and female plastic surgery, but over the years I would say 40 percent of my patient population are men. I’ve heard you’ve pioneered your fair share of procedures. Can you briefly share some of these with our readers? Well I started with a buttock enlargement procedure. About 25 years ago actually. That was way before anyone was doing them, right? No one else was doing them. I published the procedure. I taught doctors around the world how to do it. I guess it is my claim to fame. By placing the implant between the two large buttock muscles: the Gluteus Maximus and Medius made me well known in that area. Now I would say 95 percent of the doctors that do this procedure use my technique. That’s quite an endorsement of your talent and claim to fame. Now buttock enhancement in particular has to be one of the most requested procedures among gay men? Yes, I would have to say 70 percent of the buttock implants are among gay men. What exactly are the implants composed of? They are a solid silicone implant. They’re not gel. They’re not liquid. They are solid, firm, yet very flexible – very pliable. They feel just like your own muscle. Because it is placed under the muscle it is very natural, very smooth. You can’t feel any edges – it’s very good. What’s the biggest myth about men having plastic surgery? Hmmm, the biggest myth about men having plastic surgery; there’s the myth that men are not quite as vain as women and that they don’t need plastic surgery. Which is a bunch of baloney. Frankly, I think men are more vain than women [laughs] and they are really catching up as far as the number of procedures performed. It has to be very satisfying for you as a doctor to make such positive changes for your patients. It’s my biggest reward. To see my patients happy and grateful. It’s so nice to hear, ‘Dr. Chugay, you have changed my life.’ That to me is so much more valuable than the money the patient pays me for their procedure. What should clients look for in a cosmetic surgeon? Well basically they should be board certified in whichever area of aesthetic surgery they specialize in. And a prospective patient should not be afraid to ask the doctor, ‘How many of these procedures have you done?’ That way you know if they are experienced or not. Ask for references, it’s okay to ask, ‘Can I talk to someone who has had a buttock implant performed by you?’ Reputable doctors will be glad to give you one or two clients names who are willing to share their experience. A lot of my own patients volunteer to talk to people considering the procedure. They do lunch and talk and the client feels so much more comfortable after hearing about their experience. It’s something we do quite frequently. The other thing is the doctor artistic? Does he have a natural talent for the procedure – an aesthetic eye for plastic surgery. Is he artistically inclined? Does he draw? Does he do sculpture? That’s the thing. You can be a good technician, but if you have no eye for it, you’re going to put the wrong nose on for the wrong person. That’s no good. You mentioned earlier the number of procedures a surgeon has performed? I’m curious, how many have you done? There are some weeks where I have done three or four buttock implants per week and I’ve been doing this for 25 years. So do the numbers – I’ve done literally thousands. Some of my newer procedures that I have developed, like my Deltoid implants, I developed last year – so I’ve done about 12 of the procedures. Some were for reconstructive purposes and some were for enhancement purposes. The calf implant, a procedure that is so popular – and again I started doing this over twenty years ago – so I’ve done hundreds and hundreds, maybe thousands. Pec implants same thing. I’ve been doing them for over 20 years. That’s truly amazing, so much experience. So what do you consider your specialty? My specialty right now is I do a lot of body sculpting. The other thing that I do, that I started doing, and I think I’m the only one doing it at this point, are Biceps and Triceps. I’ve developed the implants – developed the procedures, and published the procedures. Actually I do know of a couple of doctors in Florida who do it, but they do a terrible job. They have no aesthetic sense. They did huge implants on a small boned man and made him look like a clown.It’s really important to have an aesthetic sense. I have people coming from all over the world to have it done: Asia, Africa, Europe, Canada – they come to me for these procedures. That’s a wonderful compliment towards your talent and reputation. I know a lot of people would like to know what the recovery time is for some of these procedures. For example, how long between an implant procedure before a guy can strut his stuff poolside or at the gym? Some of the surgeries have very quick recovery. Like calf implants, within ten days most of the patients are very comfortable and looking great. Biceps, Triceps, the same way – within a week to 10 days. Buttocks take about two weeks. It’s a little bit longer recovery. It’s more pain than the other ones. Most people within one month can do any sports, any activity, virtually anything they want to do following surgery.